When the battle for Verdun stagnates in the beginning of March, the German army Command concludes that first the French artillery fire from the left riverbank has to be eliminated, before a successful march to Verdun becomes possible along the right riverbank. The Battle for the Flanks is about to begin. The attack on the left riverbank is executed by the VIth German Reserve army corps. At the left riverbank the battle starts on Monday 6 March. On the right riverbank the battle starts on Wednesday 8 March; the target is Fort Vaux. The attack has been postponed for two days because the Germans have great trouble bringing their artillery into position due to the terrible condition of the terrain. In the meantime the French have reoccupied the remaining forts and reinforced their lines of defence. The lines at Fort Vaux are the strongest frontal positions at this moment. Wednesday - 8 March The attack at the right riverbank begins as usual: first there is a drumfire of the artillery where gas grenades are used, after that a mass infantry attack follows. The Vth Reserve army corps has to execute the attack under the command of General Von Guretzky and the IIId army corps under General Von Lochow. Fort Vaux appears to be for the taking but between Hardoumont and Fort Vaux runs a 100 metres deep gorge. At the bottom of this gorge the village of Vaux is situated which is transacted by a small river that ends in a large pond in the West. The attack immediately stagnates because of the fierce fire of the French, which comes from the higher situated defence of Fort Vaux. Yet the Vth reserve army corps receives the order to attack again. This nightly German attack has an unexpected success; the French were not expecting another attack and were taken by surprise. The village of Vaux is now in German hands and the troops have reached the defence lines halfway on the slopes of the fort. The attack ends, however, in chaos on German side. In the inky darkness of the night the companies lose their way, officers disappear and there is no communication whatsoever. 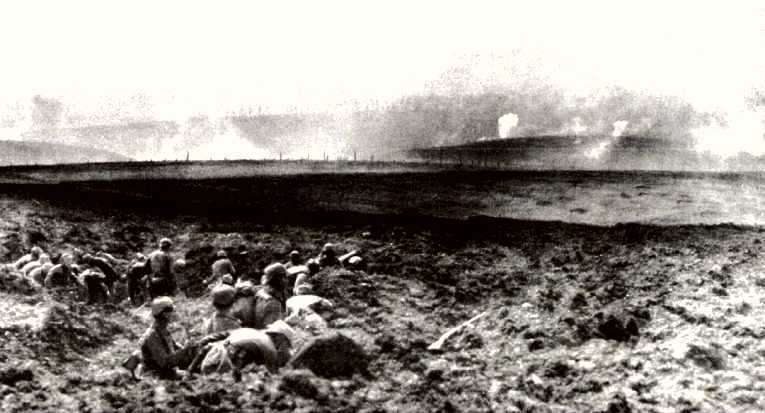 The German troops are forced to dig themselves in because of the brutal fire coming from the French lines. Thursday - 9 March In the morning the German 64th Infantry Regiment is ordered to occupy the Bois Fumin, situated next to the fort, because Fort Vaux had supposedly already fallen into German hands. Soon after, rumours are heard through the grapevine. 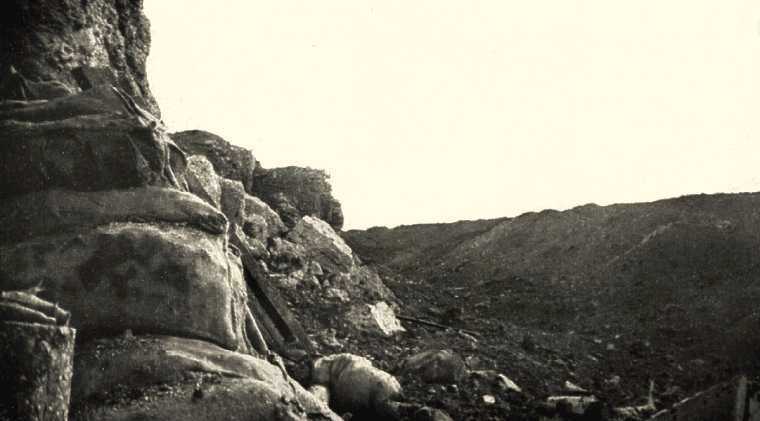 There is even speculation of German infantrymen on top of the fort. Furthermore, an alleged red and yellow German flag is seen blowing on top of the fort. That same morning the following announcement can be heard: 'have reached Fort Vaux with three companies'. This message is interpreted as 'have conquered Fort Vaux'. This message is spread to the world and General Von Guretzky is awarded the highest German decoration, the 'Pour le Mérite'. When it is discovered that the message is incorrect this bestowing of honour has to be reversed the next day. The IIId army corps headed by General Von Lochow has to erase this painful memory and is immediately ordered to finally conquer Fort Vaux entirely. But the unthinkable happens: two regimental commanders disobey this order as they feel that: 'it is useless to attack without artillery support of the flank'. The reserve forces of General Von Guretzky are then appointed to attack the fort without artillery support. This useless and bloody attack is withstood successfully by the French. Saturday - 11 March The troops of the IIId and XVIIIth German army corps are finally relieved of their duties. The men are completely exhausted. The first German attack on the right bank of the Meuse has failed. Friday - 14 April The 50th Infantry division arrives to strengthen the Vth Reserve Army Corps at Fort Vaux. At the end of April all preparations for continuing the battle are made. In the meantime General Von Mudra has been replaced by General Von Lochow as Commander of the Angriffsgruppe Ost. 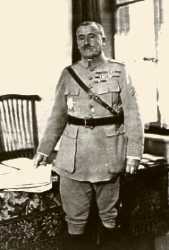 Thus far he had been Commander of the IIId (Brandenburger) Army Corps, the conquerors of Fort Douaumont. Von Mudra warns him not to take rash military decisions that will inevitably lead to more unnecessary losses. The next large attack is set for Sunday 7 May, birthday of the Crown Prince. The code name is 'May bowl'. The German army Command begins to seriously worry about the decreasing quality of the front troops. The Germans were used to sending their troops to the front and let these troops remain there for months. The losses were compensated for with young soldiers, often not above 18 years of age and without any frontline experience whatsoever. The infantry battalion commanders begged their officers to send experienced soldiers. These inexperienced children did not stand a chance there. The French, commanded by Pétain, used a totally different system. Their divisions were stationed at the front and after a short while completely replaced with fresh divisions. This so-called Noria-system provided the French with less exhausted troops than the Germans were left with. 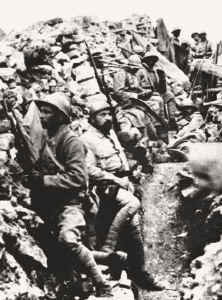 Consequently the French troops felt much more involved with the Battle of Verdun than the Germans did. 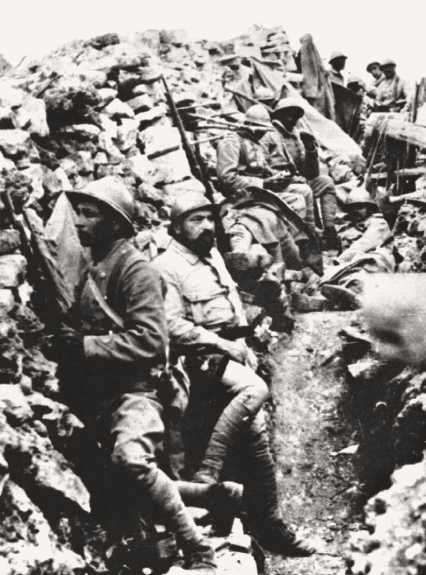 Approximately 70 percent of the French troops were sacrificed to the 'mincer' of Verdun. At the side of the French a crisis situation occurred in the army Command. 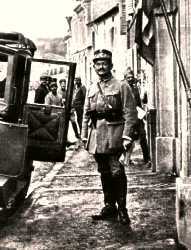 Joffre blamed Pétain a too careful and too defensive attitude. Furthermore, when Pétain demanded a longer period of rest for his divisions, Joffre concluded that the planned offensive of the Somme would be in danger. 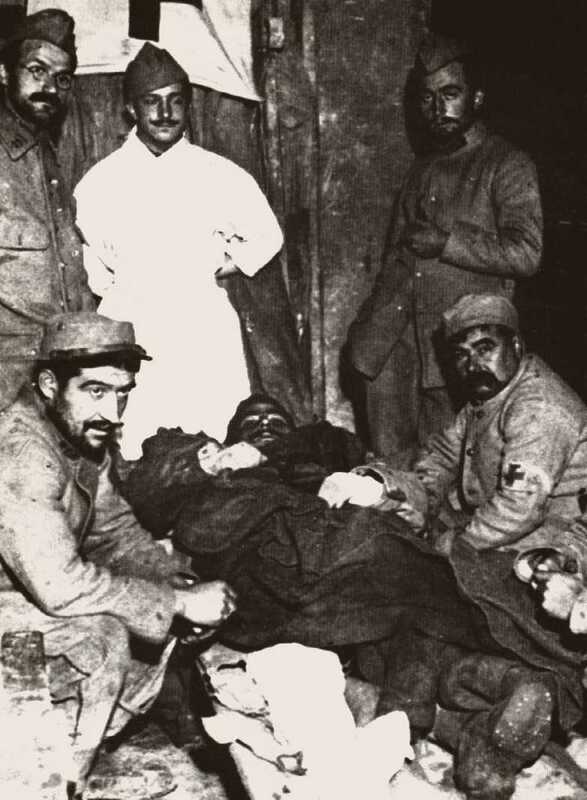 Pétain was kicked upstairs and received the function of Commander-in-chief of the Central Army Group, to which division Verdun belonged as well. His replacement from Monday 1 May was General Robert Nivelle, who was known for being a ruthless fighter that favoured the frontal attack [l’ attaque à outrance]. One of his subordinates, his right hand man, is General Charles Mangin. This is a rock-hard front General, who had already been in command at Verdun, of the Vth Division, and who was nicknamed the 'slaughterer' because of his ruthless attacks. 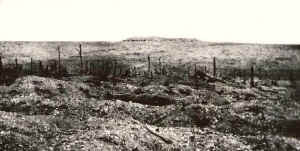 Mangin made it his aim to recapture Fort Douaumont. Monday - 1 May The attack of Fort Vaux is begun. The army command wants to clear the French lines in the Bois de la Caillette first before the fort is actually attacked. The position of these French lines is a severe obstacle for the attacker when storming the fort. However, German Headquarters decides differently: fort Vaux has to be attacked first. On Sunday 7 May it becomes clear that the German attack has failed again. The French artillery fire, lead by observation balloons and aircraft is too severe. The Germans are forced back. The attack of the Thiaumont- fortification, which was started on the same day, fails as well, due to the severe French artillery fire. There is no German air-raid protection that day. The German planes had not taken off, in order to throw of the French, and not give away the surprise attack. In the meantime Fort Douaumont has become the basis for all German activities in the frontline, against the Bois de la Caillette, the Thiaumont-line and later against Fleury. 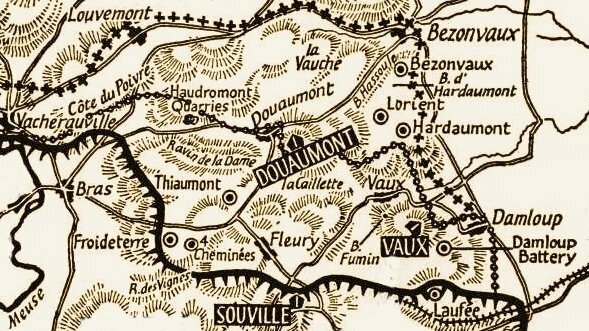 The munitions depots are situated here, wounded can receive medical attention and the provisioning of all front troops are initiated from Fort Douaumont. The fort is attacked by the French, night and day. All German activities take place at night in order for the movement of troops not to be visible from barrage balloons and aircraft. The French artillery keeps firing at the supply routes and the Germans move in between attacks. On Monday - 8 May 4:00 a.m. there is an hughe explosion in the fort. There is a large number of deaths. Because of the severe French resistance at Fort Vaux, Bois de la Caillette and the Thiaumont-fortification, combined with the catastrophe in Fort Douaumont, the German operation "May bowl" is a failure right from the start. Saturday - 13 May The German army command call a staff meeting. It is concluded that both divisions of the IIId Army corps have enough strength left to make a minor attack possible. There is a delay however, as reinforcements have to arrive first, along with a stock of a new type of poisonous gas grenades. The attack of the right bank of the Meuse is therefore temporarily deferred. The attack is now solely concentrated on the left bank. At this staff meeting the Crown Prince pleads in favour of entirely ceasing the attack of Verdun. Von Knobelsdorf, however, wants to pursue. The Crown Prince reacts: 'I will not give that order. When headquarters orders it, I must obey, but I will not be held responsible'. Ultimately on Wednesday 17 May Commander-in-chief Falkenhayn decides that the attack has to be transferred from the right to the left bank. Before this, however, the Thiaumont-fortification has to be taken because from that position everything at the German front is 'shot to pieces'. Furthermore, Fort Vaux has to be taken in one sweep. 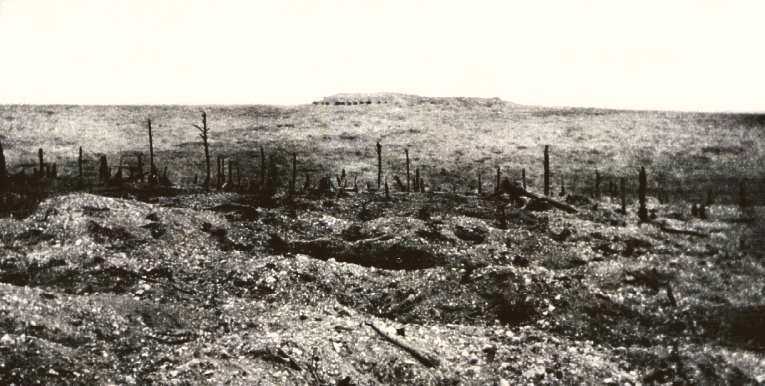 Before the Germans begin their attack, they are surprised by the French, who start a counter attack of Fort Douaumont. Between Tuesday 16 May and Sunday 22 May the fort is under heavy gunfire. Large-bore weapons and poisonous gas grenades are used. On Monday 22 May two regiments commanded by General Mangin attack the fort. 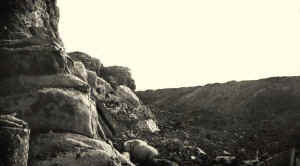 The French manage to occupy the top of the fort and even enter it in some places. The French artillery moves the frontline right up to the fort so that the Germans are cut off from reinforcements. The Germans do exactly the same behind the fort, so the French are equally cut off from reinforcements. The German attack is so severe that of the 200 men in a French attacking company, only 40 manage to reach the fort. Two days of bitter fight ensue. At a certain point the French are outnumbered, as Germans reinforcements were able to reach their troops after all. The French are also using up their ammunition and when the Germans have a huge mine-thrower attack the fort, the battle is decided in a terrible hand-to-hand fight. Only a few French soldiers return to Verdun. This French counter attack is commanded by General Mangin, who halfway through the battle announces to the world that the fort has fallen into the hands of the French; a message that has to be recalled later. This rash attack has not been well prepared for. Mangin moved his entire regiments forward into a very narrow frontline and put all of his reserves into action as well. During an attack this causes a 500-metre gap in the French line, which weakens the front considerably. The French troops are clobbered. Over 1,000 French are imprisoned and not a single reserve company is left. 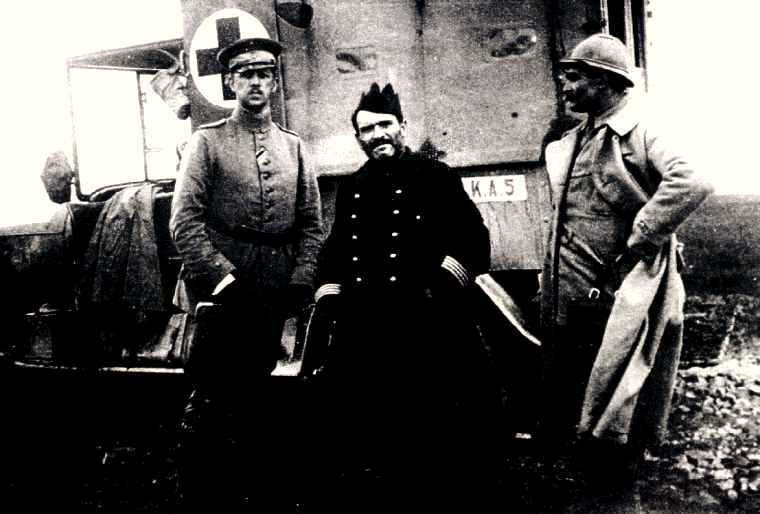 Mangin is relieved of his duties by his superior Commander Pétain. (Note: Mangin supposedly offered to serve as a common soldier again.) The failed attack has a demoralising effect on the French troops; several cases of insubordination are reported at the side of the French. Thursday - 1 June Following a lengthy bombing and with the use of a large number of flame-throwers, the Germans finally regain command of the Bois de la Caillette. The Bois Fumin, situated just behind the village of Vaux, is taken for the greater part as well, but at a high price. The major gain of this particular conquest is that the German troops in front of Fort Vaux are no longer controlled by the flanking French fire from the Bois de la Caillette and the Bois Fumin. After this the German attack focuses on Fort Vaux. This is a medium sized fort generally accounting for a garrison of 250 men, but now accommodating some 600 men. The Commander is Major Sylvain Raynal. He suspects the big attack to take place soon: in the morning the fort is caught in a rain of grenades. Raynal counts 1,500 to 2,000 hits an hour. Friday - 2 June The Germans are able to surround the fort almost completely. A few hallways are taken as well. The French men inside the fort stubbornly defend themselves and from the French frontline counter attacks are undertaken to regain control of the fort. The French artillery draws up a barrage that compels the German attackers to remain in cover. Sunday - 4 June To smoke out the French German flame-throwers are used. This attempt fails as draught forces the smoke out of the fort and obstructs the attackers in their actions. The French again undertake a few counter attacks but are awaited by German reinforcements who force the attackers back in a man-to-man fight. The Germans are again hindered in their movement by the French bombardment. Monday - 5 June Inch by inch the Germans force their way into the fort where the French, behind a barricade of sandbags, keep up a firm front. Major Raynal organises the defence in a heroic manner. His chief concern is the limited amount of drinking water available within the fort. The water tank contains less water than the gauge glass indicates. Therefore the rations of 1 litre a day per person are reduced to 1/8 litre. Wounded receive double this amount. Commander Raynal sends carrier pigeons carrying messages begging for reinforcements. Sometimes a company manages to reach the fort. In one such a case only 26 men are left of the original 170. German attempts to blow up the fort fail due to French artillery fire from the nearby-situated Fort Souville. Tuesday - 6 June The situation in the fort is terrible. The ambience is totally ruined by oil damp and dust; it is pitch dark. Regularly panic attacks start when a gas attack is suspected. The men are going mad with thirst. They lick condense water of the walls and some drink their own urine. The stench is unbearable because the latrines are out of reach; there are excreta in every corner. Finally, Raynal decides to surrender. Wednesday - 7 June A white flag appears on top of the fort and a French orderly delivers Lieutenant Rackow, the German Commander, a letter. Major Raynal requests an honorary surrender of his garrison. This is granted and the garrison surrenders in a military correct fashion; arms presented. The French are treated with respect: souvenirs are exchanged and photographs taken. The Crown Prince receives Raynal with full honour, expresses his admiration for the heroic opposition and presents Raynal with his own sword as a mark of honour. Thursday - 8 June Immediately the French start their counter attacks to reconquer Fort Vaux. On the completely damaged grounds surrounding the fort severe man-to-man fights take place. 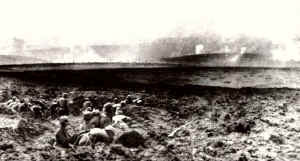 The French artillery barrages the fort thus heavily after every attack, that the Germans have to withdraw into the fort. The fights continue day and night. After ten attacks the battle is ceased and the French withdraw. 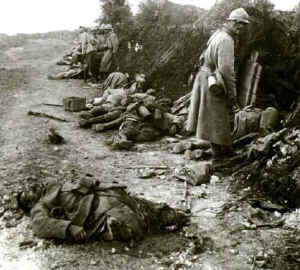 The scene of battle is strewn with dead French soldiers. Pétain is furious because of this useless attack and forbids Nivelle any further attempts to conquer Fort Vaux. As soon as possible Fort Vaux is equipped as a German base of operations, complete with munitions depot and a first aid post. 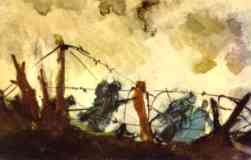 Provisioning is very difficult, as everything has to be hauled up by the men, while continuously under heavy attack by the French.